The new 2019 Ford Ranger is the latest entry into the market for midsize pickup trucks that can easily venture off-road. The available FX4 package makes it one of the best. The stock Ranger includes a gutsy and efficient powertrain attached to a steel frame and bumpers. The $1,295 FX4 package adds off-road shocks, all-terrain tires and a terrain-management system. It also adds skid plates and an electronic locking differential that puts the Ranger FX4 on par with the Chevrolet Colorado Z71 and Toyota Tacoma TRD Off-Road when it comes to exploring. The package is available on all three trims, the XL, XLT and Lariat – putting a serious off-roader within reach of most new truck shopper budgets. A week of testing the 2019 Ranger Lariat with the FX4 package proved its mettle. It ran errands around town and easily crawled a mountain range. But the midsize pickup is not without hiccups. 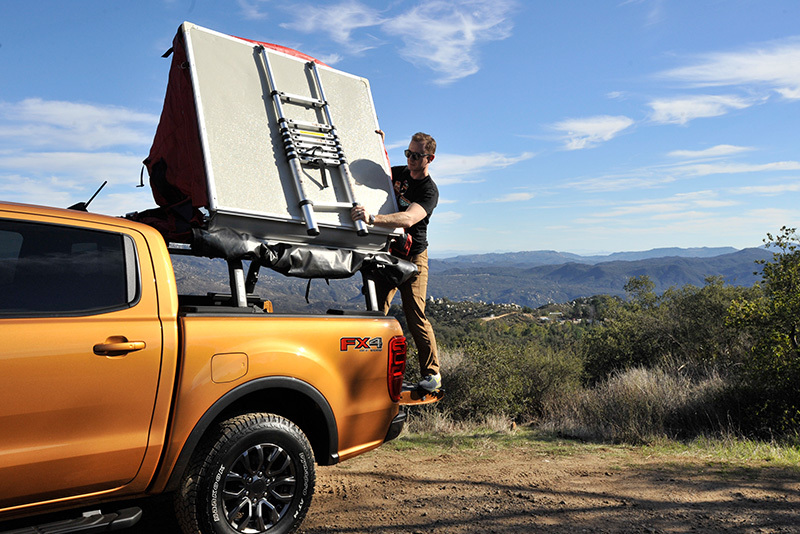 The Ranger tested by Trucks.com came equipped with Yakima bed racks and the company’s SkyRise rooftop tent. Ford and Yakima have a new partnership that allows buyers to roll the price of accessories into their truck payments. It’s an effort to appeal to rising demand for overlanding and outdoor gear. The appearance of the rooftop tent setup screams adventure. On the road toward the Santa Ana Mountains in Orange County, Calif., the Ranger provided a smooth and quiet ride. Its 2.3-liter four-cylinder Ecoboost engine and 10-speed automatic transmission make a crisp pairing. The truck’s Terrain Management System, standard with the FX2 and FX4 packages, provides four driving modes: Normal, Grass/Gravel/Snow, Mud/Ruts and Sand. It has a new Crawl Control feature that automatically handles off-road traction to power the Ranger up inclines or down steep grades. The Hankook Dynamo all-terrain tires provided a smooth ride and good grip, though rugged adventurers will likely swap them out for more aggressive rubber. The independent front suspension handled bumps well, and the solid rear axle, weighed down by the tent, felt smooth over long distances. The gas and brake pedals are both electronic. While there is little direct connection to the road, both were responsive. Combined with the powertrain, the advanced engineering made the Ranger feel ahead of rivals with older designs. The steering, however, detracted from the experience. It is also electronic and worked fine around town. But on sweeping mountain roads it felt heavy-handed. Mile after mile of changing direction created a roiling sensation in the cabin. Another weakness is the interior. It is mostly unchanged from the global Ranger on sale since 2011. The layout of small buttons can be confusing, and the helpful Sync 3 infotainment system comes on a small, 8-inch touchscreen. Leather seats in the Lariat trim provided comfortable support and good visibility compared with the Toyota Tacoma’s famously awkward positioning. But taller passengers will find rear legroom lacking, even in the larger SuperCrew configuration. The bench folds up as a single unit rather than allowing one seat to move independently for extra storage. The rear floor holds small storage spaces. The Ranger could benefit from more attention to its interior packaging. Still, the cabin is comfortable for a truck capable of tough work. It has soft arm rests and other touch points. The front and rear each have two USB ports. The Ranger is compatible with Apple CarPlay and Android Auto. Its interior is on par with other midsized trucks that also suffer from dated interior design. Ford missed an opportunity to set it apart from the competition. At a campsite in the Cleveland National Forest near the top of the mountain range, the truck settled nicely on level ground. The tent proved easy to set up. The outside cover unraveled, and the metal platform folded down flat. This automatically hoisted the tent up without the need for assembly. The ladder extended easily to the ground and made the SkyRise ready for elevated camping. Unfortunately, packing the tent up proved more difficult. It’s a trick to get the ladder steps to release from their locked position. Tent issues aside, the Ranger handled the mini-adventure well. 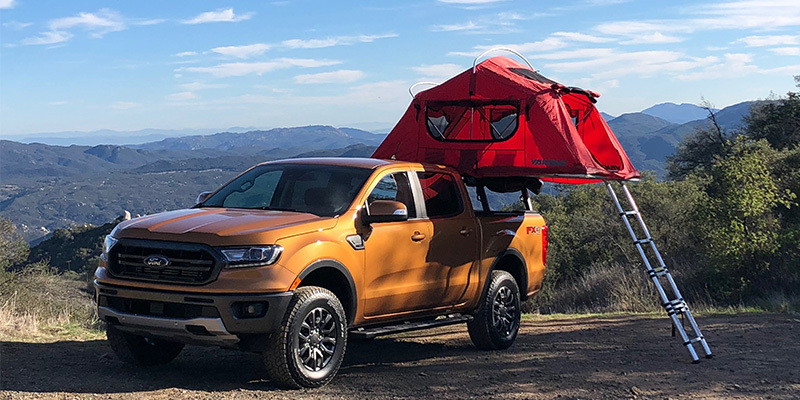 The SkyRise is a lightweight rooftop tent at just 95 pounds, while the truck has a gross vehicle weight rating of 6,050 pounds. It can haul the tent, a cabin full of passengers and a bed full of gear without trouble. 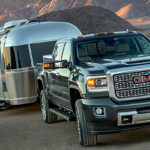 Its steel bed has six tie-downs, and all Ranger trims and configurations can tow up to 7,500 pounds with the Trailer Tow Package. Back in town the Ranger is maneuverable even with the tent on top. Its wheelbase and overall length are about 1 inch shorter than both of the best-sellers in this segment: the Chevrolet Colorado and the Tacoma. A full suite of sensors and cameras enables good visibility. The electronic steering makes handling precise at city speeds. The biggest drawback is a loud engine fan that roars in order to lug the turbocharged truck through parking lots. Overall the 2019 Ford Ranger presents good value for its performance. A fully loaded Lariat with the FX4 off-road package came to $44,170 before destination. Ignore the Sport appearance package, Bang & Olufsen stereo and adaptive cruise control – which cuts out below 12 mph – and the truck barely crosses $40,000. The average transaction price for a midsize pickup in 2018 was $32,788, according to J.D. Power. At that price a capable Ranger is the two-wheel-drive XLT trim with cloth seats and safety suite, plus the optional locking differential and tow package, for $31,010 before destination fees. It may allow buyers to add Yakima accessories and other goodies. The 2019 Ranger FX4 makes adventuring accessible off the showroom floor. It combines the no-nonsense strength of a work truck with modern technology like the turbocharged powertrain, intelligent terrain-management system and advanced safety features. However, its small missteps show that the Ranger still has room for improvement. Buyers now have a lot of choice in the midsize pickup segment. While the FX4 package doesn’t cover every blemish, it offers immediate capability that once took a lot of accessorizing. 40 grand for a four cylinder truck?